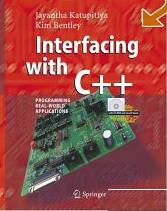 This book is for people who are interested in learning and exploring electronic interfacing as well as C++ programming in a practicable and enjoyable way. Readers will learn to program a PC to do real-world things - not simply number crunching and graphics. They will also master how to write programs that interact with real-world devices through the use of a specially-developed interface circuit board included with the book. The book, interface board and accompanying software incorporate simple and easy-to-understand projects such as digital-to-analog conversion and vice versa, DC and Stepper motor control, temperature and voltage measurement, PC-based timing, or basic data acquisition. The audience of this innovative and rewarding approach to learn interfacing real-world devices to a computer via C++ are undergraduate and graduate students in engineering and science, practicing engineers/scientists, technical workers, and hobbyists. The types of courses the book complements include control engineering, electronics, computing, and mechatronics.